With over two billion monthly active users, Facebook is one of the top social media channels businesses use to share content, promote products or services, and engage with customers. Because so many people are already on Facebook, creating a Facebook Business Page is the easiest way to attract new fans and distribute information about your company and the products and services you offer. Between organic content, campaign posts, and promoted ads, businesses have an enormous opportunity to reach a vast audience and cultivate more influence in the Facebook community. In fact, 42% of marketers say that Facebook is critical or important to their business’ marketing efforts and performance. Even better, 95.8% of social media marketers say Facebook delivers the best ROI among all other social networks. Not sure how to effectively develop a Facebook marketing strategy that will skyrocket your business success, bring in new customers/clients, and increase your revenue? Let’s dive into the key elements of a Facebook marketing strategy: With these key points in mind, you will take your business's Facebook marketing to the next level. Before things fall into place, your company should conduct thorough research. Have you attempted to use Facebook at a marketing platform before? If so, what sort of content brought you the most engagement, likes, shares, and overall best performance? Were there any areas that seemed to dangle in limbo and struggle to get off the ground and generate excitement from your audience? Once you fully understand your past performance, then you are ready to look toward the future. What are you looking to accomplish now? How will your marketing efforts improve and how will you identify realistic goal-setting opportunities for your business to monitor and measure? If you are just now wetting your feet with Facebook marketing, there’s no need to fret. You’re in the perfect place to know all the best practices of promoting your business on this social channel. You have a fresh set of eyes and a will to learn more, and with your knowledge of your brand and our guidance, you’ll be rocking it on Facebook in no time. No matter where you’re kicking off from – whether it be a totally new ballgame for your business, or you’re just brainstorming ways to build a stronger, more defined strategy – your first action should be goal setting. This is considered the outlining phase of your marketing strategy – the place where you determine your business objectives. As with any social media marketing strategy, you'll want to consider your KPIs when establishing your main marketing objectives for Facebook. Key performance indicators, or KPIs, are values that help you measure the progress of your business goals and marketing efforts. With your KPIs in mind, you now must define your marketing goals. Setting goals beforehand establishes specific targets for you to track while conducting your Facebook marketing strategy. What are your goals trying to accomplish? What impediments might affect the success of these goals? Why are these goals important to your company? How much do you want to increase your (fill in the blank) [e.g., engagement rate, impressions, etc.]? How many new visitors/likes do you want on your page? How will you know when you’ve reached your goal? Are your goals challenging, yet realistic to attain? Does your company have the capability to attain your goals both financially and technologically? Are your goals applicable to your core company objectives, your industry, or current market? Did you establish an end period? Does your desired time frame provide a sense of urgency and importance to your goals? These characteristics should be at the top of mind when strategizing. If a goal is measurable but not relevant to your company or the Facebook platform you plan to use, it probably isn’t essential to your marketing strategy. Marketing objectives for each social platform vary depending on why your business is using the platform. Nevertheless, you should be keen on building out a targeted list of objectives you want to accomplish as you administer techniques that align with your overall strategy. These examples are merely base objectives you can use to expand on to create more concrete targets. Like a SMART goal, your objectives should be specific. Depending on your business industry and intention, you should pick and choose the goals you believe will have the biggest overall impact on your organization once you achieve them. Don’t pursue them all – hone in on a few key objectives; you can always update your objectives over time and modify your marketing efforts to better your brand. Once you have your specific objectives in place, it’s now time to identify whom your strategy is targeting. You want to make sure you reach the right people who are the right fit for your company, after all. Did you know the largest age demographic on Facebook is 25 to 34? Luckily, this is the prime demographic most businesses are trying to target. Don't be discouraged if this isn't your targeted age group: it only makes up 29.7% of all users. With so many people on Facebook, businesses have the ability to attract and build a widespread and niche audience. To discover who this audience is, you will have to consider the people you are trying to reach and engage with. This is known as your target audience. Facebook is crawling with people who could potentially take interest in your brand and your messaging, which, if done right, can lead to an eventual sale. So, out of 2 billion monthly active users, who is your company trying to appeal to? What are the interests and behaviors of a person who would express interest and consider purchasing products or services from your brand? Identifying a target audience allows you to generate ideas and create content that addresses certain readers’ pain points, challenges, and interests. There are several ways to identify who your target audience is on Facebook. One way is to build a user persona. A user persona (similar to a buyer persona) is basically a representation of the ideal person following your business and engaging with your brand on social media. Everything you do on social media should form around who your user persona is, what their likes and interests are, and how they communicate. If you'd rather have more concrete, definitive information about your key target audience, your best option is to check out the Facebook Insights tool. If you’re new to Facebook for business and are building out a completely new strategy, these insights won’t be available to you just yet. However, all the top-dog social platforms have already integrated this feature into their user settings. If your business is currently active on LinkedIn, Instagram, or Twitter, you can use those audience demographics as a foundation for your Facebook target audience. Chances are, these demographics are resemblant of each other, so you won’t have to stress if you’re just getting started with a clean slate devoid of demographic data. Whether you create your ideal customer or focus on the cold hard facts from social media insights, discovering your target audience on each platform will help drive the rest of your company’s social media efforts. Your target audience may vary slightly on each social networking site, but take these variations with a grain of salt. You can still create, optimize, and share content that is relevant for each social media target audience. Your strategy might require small adjustments to messaging for each social media channel. As you gather more insights, you’ll have a better understanding of what works best for each channel. Content creation lies at the heart of your Facebook marketing strategy – without content, it's difficult to build your Facebook audience and attract and delight new prospects. It’s practically impossible to build credibility if you’re solely relying on sharing others’ content and not creating your own. The saying goes, "Content is King." And it's true. But what kind of content should you post? When should you post? These questions vary depending on your industry, but research still proves the content that has the most success and the "optimal" times for publication on Facebook. What Content Should You Publish on your Facebook Business Page? You should aim to post an equal amount of these four kinds of posts. Avoid overcrowding your Facebook feed with all photos or all links; evenly distributing what you post will add diversity to your Page and will not detract those that like your Page. The last thing you want is to come off as spammy with your content – seeing the same things over and over again with no variation and personalization will cause fatigue with your audience, and eventually, you’ll see your Page Likes drop off. Remember the impact of photo and video. People recall 65% of information three days after seeing it if the information contains some sort of visual. Compared to the 10% recall of plain text, visuals make a big difference. And marketers are taking notice: 80% of marketers currently use visuals in their social media marketing – whether it’s a video, infographic, or photo. In order to compete with these other brands, it’s imperative that you add visual elements to your Facebook content. Statistics prove it all: Facebook posts with visuals get 37% more engagement. posts that you share on your Page from other companies, industry leaders, etc. 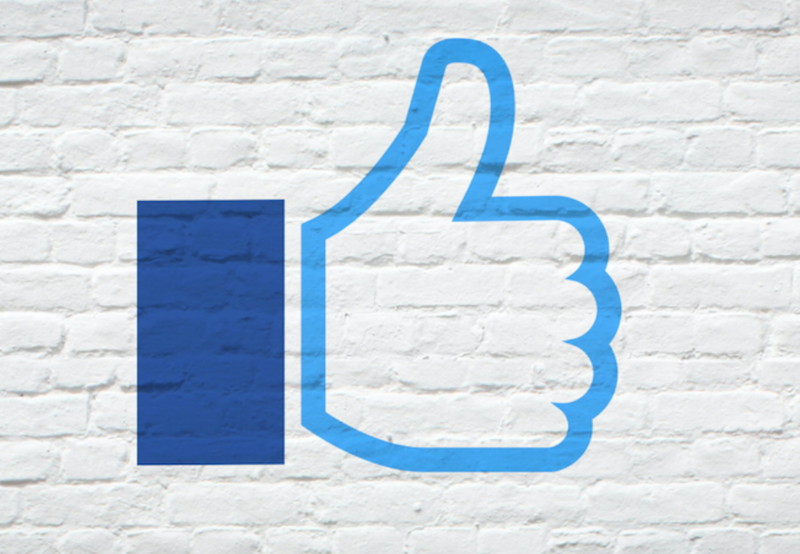 Facebook campaigns are a great way to promote the launch of a new product or service. Creating and sharing various forms of content related to your new offerings over the course of a campaign is the best way to generate the most excitement; you’ll be able to spread out your messaging without having to squeeze it into one long post. A strong Facebook campaign accomplishes two things: it creates a lot of buzz and fuels engagements with your brand. Taco Bell’s recent #TacoBell2032 is an outstanding example of a successful Facebook campaign. Though a cross-channel campaign, Taco Bell proved that Facebook is a valuable platform to promote content for user engagement. Ad hoc posts are basically single posts that don't relate to a specific campaign. This can be any standalone piece of content you think could be beneficial to share to your Facebook company page, such as blog links, company culture photos, and company updates. Mixing ad hoc posts into your content feed will break up continuous campaign posts, so your reader won’t be led to believe you only focus on one specific kind of content or focal point at a time. Curated content may not be something your business is interested in, but it is definitely a valuable way to share new information to your fans. It also shows that you aren't solely focused on your brand and only selling your company. Curated content is anything posted by other businesses, industry leaders, your employees, etc. that you publish to your own page. When your audience sees curation in your feed, they get access to different perspectives on their interests. Variety breaks up what they’re consuming from you, but it also shows that your company endorses and advocates for other ideas that are relevant within your industry. You’re demonstrating that your team is not just drinking their own Kool-Aid; they’re keeping their fingers on the pulse of the industry, which shows that your company is always staying in the know and seeking to stay informed on the latest innovations in your field. What Should the Tone of Your Content Be? The answer to this question really depends on your type of business. With social media, the tone of your content can be professional, casual, humorous, or somewhere in between. Keep your company tone at top of mind when creating new content to share on Facebook; you want to be consistent in your messaging. Be cognizant of how your tone will resonate with your followers. Your tone will represent to others who you are as a company and can, in a way, improve or tarnish your company’s reputation. If your company was a divorce law firm, do you think posting a funny meme about someone filing for divorce would appeal to your customer base? Yeah... that would just be awkward. When it comes to tone, consider who your company is, who your audience is, and the message you want to spread though your social networks. While Taco Bell can get away with silly, humorous Facebook posts and videos, a divorce law firm can not. The tone of your post can also vary depending slightly on the type of post it is. On Facebook, for example, you'd want to use an inviting tone when promoting an event, but you may not want to use that same tone when sharing a link to a serious article. All in all, consider the message you’re sending and how you want users to feel when they read it: let the attitude of your content drive engagement on your page. When Should You Post on Facebook? 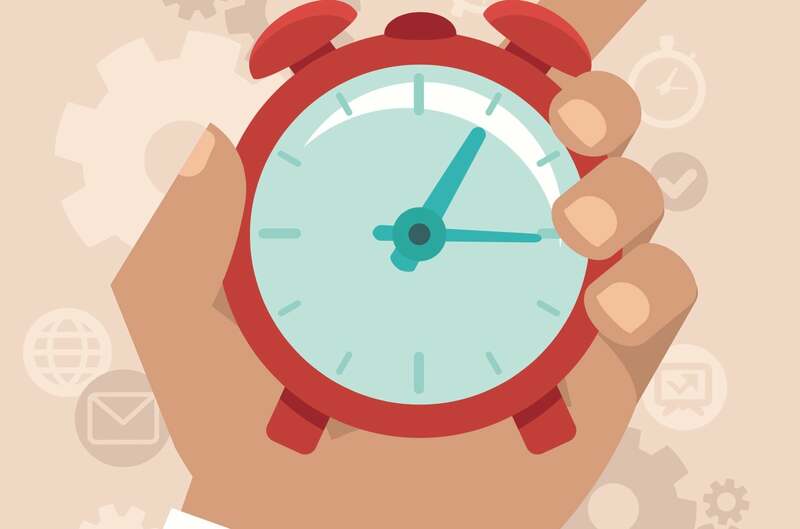 Timing plays a big role in getting more likes, comments, shares, and click-throughs. You want to optimize when and how often to post content on each platform because the "lifespan" of a post on each social channel varies. Not everyone is on the same page about the “best times” to post on Facebook and social media in general. It’s always best to seek out studies, research, and reports from different kinds of sources when trying to identify best practices. Social media is a powerful tool that can be used to amplify your brand. But how can you reach your audience at the right time in such a fluid environment? Here are the best times to post on social media. After our team conducted extensive research on this topic, we found that businesses who use Facebook benefit most from posting once or twice a day; you shouldn't annoyingly fill up a customer's Facebook feed with the same product photos, promotions, and blog links. The times are constantly changing with shifting user behavior patterns, but on average, the best times to post on Facebook are on Monday, Wednesday, Thursday, and Friday between the hours of 1 p.m. and 3 p.m.
Don't forget to schedule content to post on weekends, too. Your post has the highest chance of getting seen by the most people between around 12 p.m. and 1 p.m. on Saturday and Sunday. Develop an editorial calendar to help you keep track of what content is publishing when. Lay out publishing dates for your campaign posts, spacing them out over a several day period. Pre-schedule blog posts to publish once the article goes live, and even strategize days to post company photos and updates. You can actually draft and schedule posts directly in Facebook, if you so choose. To do so, write out your post, then under the News Feed settings, select either Share Now, Schedule, Back Date, or Save Draft. When you schedule posts through Facebook, it will create an “editorial calendar” where you can view your scheduled posts and edit, reschedule, publish now, or delete. Manage your scheduled posts and drafts under your menu tab, then under Publishing Tools. At Bluleadz, we use HubSpot for all our marketing needs, from website to social. HubSpot features a handy social publishing tool, which allows us to schedule out Facebook posts in advance – that way, we aren’t scrambling each day to get the right content out. If you aren’t currently using HubSpot, there are plenty of other social media management tools that can perform the same scheduling functions and make your social jobs easier. Hootsuite and Buffer are two great platforms that can get you started with a social editorial calendar. Engagement is a key element in any effective social media strategy. On Facebook, you should aim to engage with your audience, as well as encourage your audience to engage with you. Engagement is a two-way street, after all. Social media makes it easier for people to contact a company and receive a more immediate response. It also allows businesses to connect and interact with their audience in an organic way. Besides LinkedIn, businesses on Facebook should behave and interact in a slightly more professional manner compared to how you engage on, let’s say, Twitter or Instagram. Facebook can easily serve as a professional social media setting where users can learn more about your products and services and ask valuable questions to help influence their buying decision. 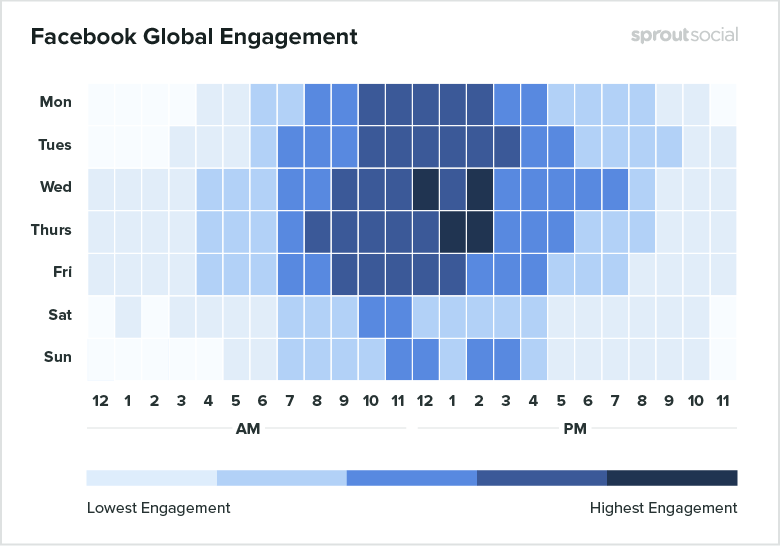 What are some essentials to engagement on Facebook? While it may seem surface-level, there are actually a lot of ifs and thens to engagement. You should be aware of how to engage with your audience when certain situations arise and know what is an appropriate way to interact with consumers. If you're a business on Facebook, it doesn't really benefit you to like and comment on other people's organic posts, especially if it doesn't relate to your company or industry. For any business, a Facebook best practice is to like and comment back to people who are engaging with your own posts. If someone leaves a comment back saying they loved the article you posted a link to, like their comment to affirm that you acknowledge their response; better yet, reply with a comment saying you're glad they enjoyed it. This may be a great plug-in opportunity to share a related article and tell them to check that one out next. Hey John! We’re so glad you enjoyed this article. It can definitely be helpful to people looking for a job. Positive comments are always admirable to receive. It confirms the content you are sharing is relatable to your audience, and they appreciate the insight and information you’ve provided them. As mentioned above, respond in a friendly, excited way with a personalized thank you message. However, not every customer is a happy customer, and some people turn to social media to express their animosity. Don’t expect a negative comment to pop up all the time, but it can happen, so your company should be aware of what to do if a negative comment comes your way. By responding to a negative comment, you are telling the user that you engage with all of your audience, not just those that like your content. In the case of a negative comment, assure the user you appreciate their input.Feel free to defend yourself, but refrain from using terms and phrases that are rude or insinuative. Don't think you are acting cowardly as a business by deciding to hide or remove a negative comment; it all depends on how your company wishes to handle these situations. If you think your audience would be appalled by a particular comment, then sometimes removing it is the best decision. You don’t want to mute your audience’s opinions, but negative comments that you feel are unfair and poorly judged can adversely affect your company. Meet with your team to establish a plan for handling negative comments – the more united your business is on these tricky situations, the easier it will be to handle them in the future without conflict. Businesses on Facebook do have the option to moderate comments before they get published on their Business Page. If you want to be cautious about what is commented on your feed, this may be something you’d want to edit in your Page settings. In the settings tab under general, you have Page Moderation, which will allow you to block comments that contain certain words from being published. You can also turn your Profanity Filter on, set to either medium or strong. Facebook sets profanity filter parameters based on the most commonly reported words and phrases marked “offensive” by the Facebook community. If you constantly notice one mean person commenting on your feed, you have the ability ban them from your page. Again, this is a last resort option, and isn’t likely to happen often, but banning people will prevent them from accessing your page any further. Reactions are fairly recent to the Facebook community. With a selection of animated emoticons, people have the freedom to share reactions to posts, a step up from the traditional "like." Basically, they’re short, sweet, and to the point. Reactions reside as an alternative option to the like button. You can react to any post on Facebook – even to comments! To “react” to a comment or post, hover over the like button and the reactions will appear. On a phone, hold down the like button to reveal reactions. Now, reactions bring animation to your Facebook feed. Rather than just liking a great piece of content, share a heart or express a relevant emotion. Reactions make engaging with users even easier. Note: While Sad and Angry can be relevant to some content you see and some comments you may receive, refrain from using them to react to the content. Remember that you are a business first, and you should positively represent your brand on social media. Utilizing Facebook Messenger as a business can bring your customer support to new heights. According to a Facebook Third Quarter 2017 Earnings Call transcript, more than 20 million businesses use Messenger to communicate with customers. Facebook Messenger is a great feature to use for one-on-one conversations with your customers. If someone has an issue they need resolved and they start searching around on your company Facebook page for contact information, they can easily connect with you on Messenger instead. There's nothing I hate more than spending 20 minutes on a phone call with an automated voice that won't let me speak to someone directly. In my opinion, if the only option to resolving an issue with a company is by calling or sending an email, I often won't even bother trying. By utilizing Facebook Messenger for customer support contact, customers will be able to connect with an employee at your business in real time. No angry customer likes to wait: make sure you respond to any complaints in a timely manner. Having someone monitor your Business Page throughout the day can ensure that you don’t leave someone hanging. A business that cultivates a solid customer support system builds trust and rapport with leads, prospects, and customers. Building trust is just another beneficial factor in growing your reach and generating new leads. Facebook offers customizable settings for businesses who want to set up how users can message their Page. These are located within the Messages tab of your business’ Facebook Page settings. Your business should decide what settings they want on and off. Under General Settings, decide if you want to use the return key to send messages – although a very minor feature, you don’t want to accidentally send a message in progress to an unhappy customer if you’re just trying to create a new paragraph. Response Assistant settings deal with instant replies, response times, and Messenger greetings. Turning on instant replies will let people know that you’ll respond to their message soon. It’s a good idea to have this setting turned on to set expectations for future engagement. If your company has a 50% response rate, your response time will read, “Typically replies within an hour.” Try boosting this rate by responding to at least 75% of your Facebook messages in a day to show a more accurate response time to users. Turn on auto-replies when you’re out of the office to ensure the people who message your company that you’ll respond to them at the next earliest convenience. 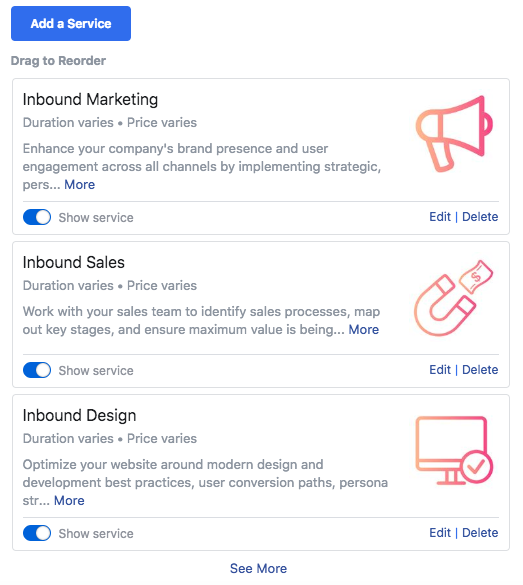 In February 2018, Facebook launched Facebook Appointments – a new feature that allows prospects to request appointments with your business. If you want to use Facebook Appointments natively, you can link your button to Messenger. People choose their appointment date and time based on the availability schedule your create. To set this feature up, add a “Book With You” button to your Page, then click “Book Now.” If you don’t want to use Facebook Appointments natively and you’d rather send them directly to your website booking, you can set that up as well. Customize the days and times you want to offer appointments on your calendar. Next, you’ll be able to adjust certain preferences for the appointments that get booked. Do you want the power to approve appointments before they are confirmed? Toggle Appointment Approval to ON. If you want to set advance notice settings, establish how far in advance people must schedule their appointments. If your company is actively using Google Calendar to schedule meetings and daily tasks, you can turn on sync to keep you on top of your schedule. The last part in this step is set a default duration of your appointments in order to prevent overlapping appointments. Will your average appointment last an hour? Two hours? Thirty minutes? Be sure to customize the duration accordingly. The services offered in your appointment booking are the services listed on your Facebook Page. On our Bluleadz Facebook Page, the services we list are Inbound Marketing, Inbound Sales, Inbound Design, Pay-Per-Click, and Free Marketing Review. Pick and choose which services you want to offer as an appointment. Once you’ve properly established the setup of Facebook Appointments, you’re off to the races. Now, interested users who stumble upon your Page have a fast-track way to book time with your company to learn more about your services. So you spent countless hours planning, posting content, and engaging with users to form new relationships. How can you tell if all the effort is actually working? Luckily, Facebook Insights will be your new best friend to monitor the progress of your marketing goals. Take a look at the insights for your company's Facebook Business Page. What has increased? What has decreased? Use these metrics to determine how close you are to achieving the goals you created at the beginning of your marketing plan. Monitoring likes on your company page can help you identify if you are successfully increasing your brand awareness. If you notice your page likes or net likes are dropping, you might want to consider new ways to build your brand awareness. Tracking reach can be helpful to see the positive and negative engagement your business page is receiving and how they are impacting your overall reach. Things like comments and shares help you reach more people, while hides and unlikes negatively affect your reach. In the Visits metrics tab, you can see the number of times people viewed your Facebook page and the number of times people were sent to your page from another website. Tracking posts is a great way to figure out when you should post your content; find the times that your specific audience is on Facebook, and schedule your posts during those times to increase the likelihood of your post being seen. You can also see the success of different types of posts you create to determine which types you should focus on in the future; pay less attention to the types of posts that aren't doing the greatest, but do not ignore them. These types of metrics are best for businesses who post a lot of video-based content. Video views are calculated as the number of times your videos were watched for more than three seconds. This is a great way to get an idea of your audience demographics. Knowing your most engaged audience allows you to adjust the content your company publishes to adhere more specifically to their likes and interests. Track these many metrics over periods of time, so your company will be able to see what has changed from month to month, giving you an idea of things to continue doing or certain strategies to adjust. The more you know about how Insights works, the more you can learn about the success of your marketing and adjust any areas that may not be working. Social media marketing requires trial and error. What may work for a Fortune 500 company may not work as well for a small business. Frequently checking your insights will allow you to make necessary adjustments to your marketing goals and the current tactics you’re using to achieve them. While posting engaging content and interacting with leads, prospects, and customers will get you far as a company, it can’t hurt to pay to promote your content every once in a while. On Facebook, only those who like your company Page will be able to see your content in their feed as they scroll. Let’s say you have 1,000 people who like your Page. That’s awesome! But, how can you expand your audience? Unless people are sharing your brand through word of mouth, sharing your content, or tagging friends in comments, it can be challenging to reach beyond the parameters of company likes. To tackle this issue and push your content out to an audience who you expect would like your content, you should try paid content. What is paid content on Facebook? How does it work? What will it do for my company? As of Q3 2017, Facebook saw that more than five million businesses were utilizing paid advertising. And there’s good reason why you should, too. There are three different types of paid content on Facebook: Boosted posts, Facebook Ads, and branded content. Let’s discuss these awesome promotional tools in more depth. Boosted posts are a great Facebook feature that allows you to “boost” posts to reach a larger audience than just those who like your company Page. It’s considered a shortcut version of running a full Facebook Ad. The great news is: Any piece of content you publish on Facebook can be boosted. These posts are already displayed on your Page and your followers’ news feeds, but now you have an opportunity to get more eyes on content that you feel would be valuable and attract a lot of engagement. Increased engagement could turn into more Page likes, even more engagement on organic posts, and new prospects. Try to select posts that are most essential to your brand and a product/service you are offering. As boosting posts is focused mainly on boosting engagement, you want to pick the posts that have the highest chance of performing well. So, what features are available when you boost a post? In a brief summary, there are many benefits to boosting a post, including a customized audience, budget, and duration. You get to decide how long you want to run your boosted post – in the creation phase, you can toggle and play around with budget and ad duration to see the potential impact on how many new eyes will be exposed to your content. This is definitely a feature you want to utilize to its fullest extent. Even an extra $10 a day can improve your potential reach vastly. What is a Facebook Boosted Post, and how can your company use it? Utilizing Facebook Boosted Posts every once in a while can help boost engagement on your Facebook content. Facebook Ads may appear similar to a boosted post on the surface. And a boosted post is technically considered an ad. However, Facebook Ads, sometimes referred to as dark posts, are created through the Ads Manager and features more advanced customization options. 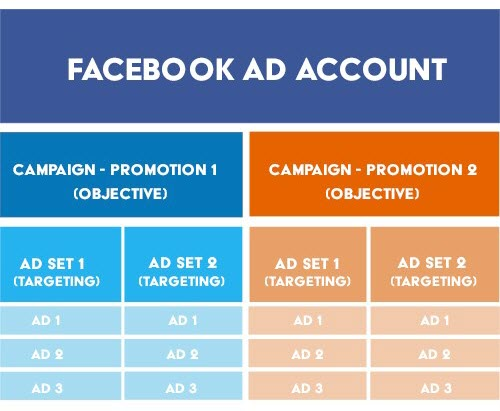 Facebook Ads are structured in a flow chart format. First, you will create a campaign. Under your campaign, you will build ad sets. From each ad set, you will create a specific ad for distribution. This flowchart can be as small or as large as you want, depending on how you want to analyze your ad success. Typically, building out new ad sets and different ads produces an easy comparison chart for your business to research what objective, ad set, and types of ads perform best with your target audience. Create campaigns for each business goal you establish for your Facebook marketing. This allows you to structure off new ad sets and actual ads that are directly linked to your campaign and the designated objective you’ve built it to achieve. Objectives help you measure and analyze the results of your campaigns. You will have the option to select an advertising objective for each campaign you create in the Ads Manager. To analyze the performance of your campaign, check out the ads reporting tab in Ads Manager. Ads sets are created under your campaign and include the target audience you identify, the budget and schedule you create, and the placements you choose for delivery (where your ads will show up to the target audience you created). You should create multiple ad sets per campaign so you can actively compare them against each other and determine your most responsive audience. The actual creative ad you create will be placed under a specific ad set. These ads can be photos, videos, links, or text. It’s smart to create multiple ads that vary in style. You are limited to 50 ads per ad set, but you have the ability to toggle each on and off, so you can stop any poor-performing ads from distributing. Where Can You Place Your Ads? The great thing about building out ad sets is that you can customize your audience, placement, budget, and schedule to fit your objectives and resources you allotted to spend for your campaign. But where exactly will your ads show up? Facebook currently offers 13 different placements where your ads can be displayed. Keep in mind that not every placement is always available. Depending on the type of ad you create, certain placements might be excluded from your specific ad placement. You can choose whether to have automatic or manual placements. Manual placements work if you are looking to specifically distribute your content in one area of Facebook. Choosing automatic placements will place your ad in every available spot from the above list. No one tells it better than Facebook: To learn how to create a Facebook Ad in your Ads Manager, check out Facebook Business for all the essential steps as well as some tips and tricks to optimize your ad performance and results. This is commonly known as influencer marketing or influencer content. Depending on your industry, your company might want to hire an influencer to promote your brand, products, or services. An influencer is kind of like a celebrity in the social media realm: they can be industry leaders, local figures, public figures – basically anyone who has a strong social following that somehow relates to your industry. Influencer marketing is on the rise on social media; in fact, a Collective Bias survey revealed that when making buying decisions, 70% of millennial consumers are influenced by recommendations of peers. More so, 30% of consumers are more likely to purchase a product that was recommended by a non-celebrity blogger. Influencer marketing is essential to appealing to customers, and it doesn’t take an A-list celebrity to market your brand. It’s important to find social media influencers that work in your industry or at least have some sort of influence in the industry you work in. Page like count isn’t the most valuable thing to search for when finding the right candidates to post branded content for your business. There are a lot of people on social media who buy their follows and likes, so you have to be cognizant during your research. Instead, look for the people who actively get their audience engaged with their content. What do they do well that attracts users to their content? Are they authentic, passionate, and honest about what they do and what they sell? People trust people who are honest. Find someone willing to actually use your products and services and provide real, raw feedback on ways to improve your branding. You can’t have a PB&J without bread, peanut butter, and jelly. Similarly, you can’t have an effective marketing strategy without the substance. Your strategy is the bread: everything you do should fit perfectly inside your strategy. Your content assets are the peanut butter: the more and more layers you add, the more substance you add to your authority and credibility. Be honest: everyone loves the peanut butter more than the jelly, but it doesn’t mean that the jelly should be forgotten, or else you’d no longer have a delicious PB&J … it’d just be a PB. Your metrics are the jelly: they should never be forgotten, and adding that extra layer will keep you on track of your strategy to identify the positives, negatives, and improvements. Identify both the strong and the weak points of your old marketing efforts. Create a dedicated team that will build out new objectives for your business. Outline content strategy to keep your efforts focused on your bigger picture goals. Be active on Facebook, monitoring your content engagement, answering valuable questions, and building relationships to encourage leads and prospects to make buying decisions. Work hard: this isn’t a one day task.